Having recognized that the Open (O), high (H), low (L), and close (C) serves as the best way to summarize the trading action for the given time period, we need a charting technique that displays this information in the most comprehensible way. If not for a good charting technique, charts can get quite complex. Each trading day has four data points’ i.e the OHLC. If we are looking at a 10 day chart, we need to visualize 40 data points (1 day x 4 data points per day). So you can imagine how complex it would be to visualize 6 months or a year’s data. As you may have guessed, the regular charts that we are generally used to – like the column chart, pie chart, area chart etc does not work for technical analysis. The only exception to this is the line chart. The regular charts don’t work mainly because they display one data point at a given point in time. However Technical Analysis requires four data points to be displayed at the same time. The focus of this module will be on the Japanese Candlesticks however before we get to candlesticks, we will understand why we don’t use the line and bar chart. The line chart is the most basic chart type and it uses only one data point to form the chart. When it comes to technical analysis, a line chart is formed by plotting the closing prices of a stock or an index. A dot is placed for each closing price and the various dots are then connected by a line. If we are looking 60 day data then the line chart is formed by connecting the dots of the closing prices for 60 days. The line charts can be plotted for various time frames namely monthly, weekly, hourly etc. So ,if you wish to draw a weekly line chart, you can use weekly closing prices of securities and likewise for the other time frames as well. The advantage of the line chart is its simplicity. With one glance, the trader can identify the generic trend of the security. However the disadvantage of the line chart is also its simplicity. Besides giving the analysts a view on the trend, the line chart does not provide any additional detail. Plus the line chart takes into consideration only the closing prices ignoring the open, high and low. For this reason traders prefer not to use the line charts. The bar chart on the other hand is a bit more versatile. A bar chart displays all the four price variables namely open, high, low, and close. A bar has three components. The central line – The top of the bar indicates the highest price the security has reached. The bottom end of the bar indicates the lowest price for the same period. As you can see, in a single bar, we can plot four different price points. If you wish to view 5 days chart, as you would imagine we will have 5 vertical bars. So on and so forth. Note the position of the left and right mark on the bar chart varies based on how the market has moved for the given day. If the left mark, which represents the opening price is placed lower than the right mark, it indicates that the close is higher than the open (close > open), hence a positive day for the markets. For example consider this: O = 46, H = 51, L = 45, C = 49. To indicate it is a bullish day, the bar is represented in blue color. Likewise if the left mark is placed higher than the right mark it indicates that the close is lower than the open (close <open), hence a negative day for markets. For example consider this: O = 74, H=76, L=70, C=71. To indicate it is a bearish day, the bar is represented in red color. The length of the central line indicates the range for the day. A range can be defined as the difference between the high and low. Longer the line, bigger the range, shorter the line, smaller is the range. While the bar chart displays all the four data points it still lacks a visual appeal. This is probably the biggest disadvantage of a bar chart. It becomes really hard to spot potential patterns brewing when one is looking at a bar chart. The complexity increases when a trader has to analyze multiple charts during the day. Hence for this reason the traders do not use bar charts. However it is worth mentioning that there are traders who prefer to use bar charts. But if you are starting fresh, I would strongly recommend the use of Japanese Candlesticks. Candlesticks are the default option for the majority in the trading community. Before we jump in, it is worth spending time to understand in brief the history of the Japanese Candlesticks. As the name suggests, the candlesticks originated from Japan. The earliest use of candlesticks dates back to the 18th century by a Japanese rice merchant named Homma Munehisa. Though the candlesticks have been in existence for a long time in Japan, and are probably the oldest form of price analysis, the western world traders were clueless about it. It is believed that sometime around 1980’s a trader named Steve Nison accidentally discovered candlesticks, and he actually introduced the methodology to the rest of the world. He authored the first ever book on candlesticks titled “Japanese Candlestick Charting Techniques” which is still a favorite amongst many traders. Most of the pattern in candlesticks still retains the Japanese names; thus giving an oriental feel to technical analysis. While in a bar chart the open and the close prices are shown by a tick on the left and the right sides of the bar respectively, however in a candlestick the open and close prices are displayed by a rectangular body. In a candle stick chart, candles can be classified as a bullish or bearish candle usually represented by blue/green/white and red/black candles respectively. Needless to say, the colors can be customized to any color of your choice; the technical analysis software allows you to do this. In this module we have opted for the blue and red combination to represent bullish and bearish candles respectively. Let us look at the bullish candle. The candlestick, like a bar chart is made of 3 components. This is best understood with an example. Let us assume the prices as follows.. Here is a little exercise to help you understand the candlestick pattern better. Try and plot the candlesticks for the given data. If you find any difficulty in doing this exercise, feel free to ask your query in the comments at the end of this chapter. Once you internalize the way candlesticks are plotted, reading the candlesticks to identify patterns becomes a lot easier. This is how the candlestick chart looks like if you were to plot them on a time series. The blue candle indicates bullishness and red indicates bearishness. Also note, a long bodied candle depicts strong buying or selling activity. A short bodied candle depicts less trading activity and hence less price movement. To sum up, candlesticks are easier to interpret in comparison to the bar chart. Candlesticks help you to quickly visualize the relationship between the open and close as well as the high and low price points. One can customize the time frame as per their requirement. For example a high frequency trader may want to use a 1 minute chart as opposed to any other time frame. Here is a quick note on different types of time frames. As you can see from the table above as and when the time frame reduces, the number of candles (data points) increase. Based on the type of trader you are, you need to take a stand on the time frame you need. The data can either be information or noise. As a trader, you need to filter information from noise. For instance a long term investor is better off looking at weekly or monthly charts as this would provide information. While on the other hand an intraday trader executing 1 or 2 trades per day is better off looking at end of day (EOD) or at best 15 mins charts. Likewise for a high frequency trader, a 1 minute charts can convey a lot of information. So based on your stance as a trader you need to choose a time frame. This is extremely crucial for your trading success, because a successful trader looks for information and discards the noise. When close > open = It is a Bullish candle. When close < open = It is a Bearish candle. So, i think i got my answer now. For identifying whether the market is bullish or not, we had to calculate open minus close. In the earlier module, it was mentioned that TA is not for long term investor, but here it is mentioned that for long term weekly/monthly charts to be used. Its a bit contradictory, please elaborate. Also what about short term(week to a month) or medium (weeks to few months) terms, what charts to be used? If your investment horizon is over 1 – 2 years then it makes sense to look into the fundamentals of the company. However if you want to set up a trade for 3-4 months then it makes sense to look into TA. So yeah, from convenience point of view it makes sense to bifurcate long term into 2 baskets – The TA based long term (3-4 or maybe upto 6 months) and The FA based long term (1-2 years plus). please elaborate. Also what about short term(week to a month) or medium (weeks to few months) terms, what charts to be used? For any non-intraday trading positions, I would always look for the EOD charts. SIR A HINDI ME NAHI MILEGA? Deewakar, unfortunately, we don’t have this in Hindi for now. information is very good .. but i suggest zerodha should have placed a video tutorial for TECHNICAL ANALYSIS for better understanding of the charts . Do you have a Vidio tutorial of technical Anaysis to plot the charts in pi . I can just not understand how to plot it in pi. Very good, informative, simple words and short.BUt one should already know how to draw graphs. Thanks Reyazn. There are many softwares that let you plot these charts. 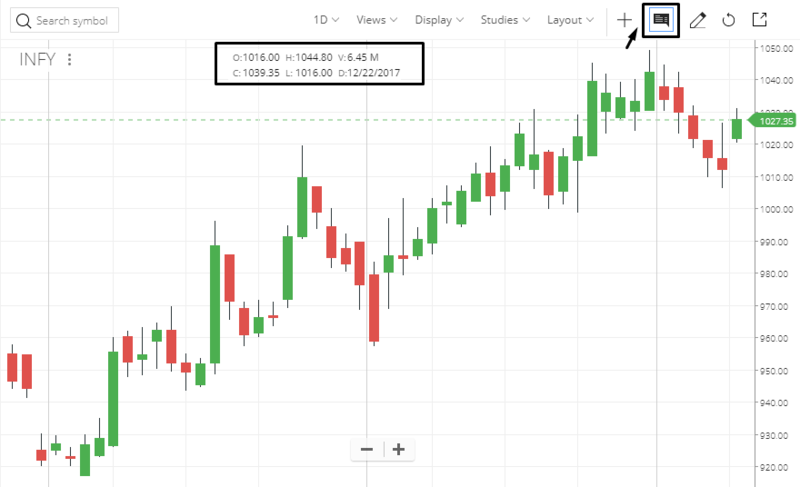 Before connecting with Zerodha i use to search lot of websites for a good charting website, and at last i was banked with chartink.com i believe ita a wonderful charting website, especially for TA. well whel i opened “zerodha kite” for the first time just last wednesday 13th April, 2016, “i was on cloud 9 after seeing the one minutes charting”, which is as needful as a basic slate for first time school goers kid. how would i plot chart….is there any video sir. While in a bar chart the open and *low* prices are shown by a tick on the left or the right sides of the bar, however in a candlestick the open and close prices are displayed by a rectangular body. Thanks for pointing this, made the correction. Can we say marked candles as bearish engulfing? Not actually since the prior trend is not really bullish. In fact it is more sideways. Can you please suggest any sites/softwares wherein , say a data about a particular stock over a period of say 10 days gets synced into an a excel sheet as and when required, coz i have a problem updating the prices manually ..
Any solution for this ? Any free softwares for indian markets? Have you checkout Zerodha’s Pi? I guess that will solve a lot of your problems :). Check out http://www.zerodha.com/pi . Suggest you shoot an email to [email protected] for this. Is it possible for me to use the datafeeds from Pi to my RStudio setup. Currently I use RStudio to connect to Yahoo and google finance for analysis. We don’t provide feeds from Pi to any other source as it is a regulatory mandate..it falls under the data redistribution act. Ok, In that case what is the protocol used by Pi to get the data from the server. What is the latency? Is this something I could use once I signup? Sorry for the delayed reply Floyd. However I believe this is proprietary information and cannot be disclosed. Sorry, I was unable to spot these. Can you kindly elaborate? in earlier version I was able to expand/reduce MACD/RSI rows as required for better view. but now i cant do it. why? can it be restored? Do you know of any websites similar to nsebsecharts dot com which offer FREE Live technical charts with Realtime ticker? I found this chapter very informative and useful ; but i still feel that line chart is quite useful for a beginner like me. what is renko chart? which type of traders commonly it use? Renko is an other charting technique like – bar chart, line chart, or candlestick. It comes with its own set of patterns and trade identification techniques. when I select renko as chart type for nifty futures, i do not get all data. just few days and it does not show todays data. I have set range to 22. please advise. thanks. Request you to email our support here – [email protected] , thanks. What is the size of Renko decider?? Is that ATR 14?? Default brick size is calculated using Caveman algorithm. This algorithm uses 300 aggregated bars of data on the chart based on the timeframe selected and comes up with a reasonable default value. The default range can be adjusted based on your requirements from the Display option. I dont have zerodha account yet. Can I use PI software??? Why not use https://kite.zerodha.com/ ? Do we OHLC only for a day or can we have it for 15-20 minutes or any other shorter time frame also? OHLC for a day is the opening price of the day, highest traded price of the day, lowest traded price of the day, and the closing price of the day. Similarly, for a 5/10/15/20 minute chart the OHLC will be compressed for the time frame. So yes, you can have it for 15-20 minutes. Hi Karthik, I am going through Varsity and let me tell you that this is one of the ‘best’ ‘best’ resource to start if you are a newbee to trading. The quality of material is excellent. What leave me baffeled is the honesty with which you and Zd team promptly answer the questions posed by readers. Thanks Anand, encouragement such as this motivates us to do better and better:). Please stay tuned, we have some really exciting content coming up! I wish Pi had weekly and monthly charts. It’ll such a nice improvement. Will convey the same to Pi team! Thanks. Have you tried Kite? Kite has weekly/monthly charts. I want to understand the difference between Pi and Kite ? Which one is better ? Who generally use Pi and Kite ? Charts are the same, so that leaves us with which platform is convenient. For me both are good, but I like Kite as its a browser based application. I needed to know about Renko Charts. Can you provide some information about using those charts for futures trading. Also need to know how to use Renko Charts in Kite. Renko is available on Kite, just click on chart types in your chart window and scroll down to select Renko. We will try and put up some notes on Renko. Well, charting on Kite is a 3rd party engine so making changes to that is not quite easy. Can you please add wicks to the Range Bars chart. Otherwise, it looks so easy that a monkey can trade. Obviously its quite misleading. Range Bars without wicks is close to useless IMHO. Thanks for your understanding. Do you mean to say you are going to add soon. Please confirm. BTW the options write up and others too on the varsity were out of the world. You could definitely consider writing. Please keep up the good work. Is it possible to view a particular intraday or even a weekly chart on Pi? For e.g I need a chart for 1st June 2015 Nifty? If not, can you recommend any source/website/software to get such information? Intraday may not be possible when you date back so much. However EOD is possible on both Pi and Kite. Naresh – request you to send this request to [email protected], thanks. I’m not a geek but wonder why there is no software to determine support and resistance levels of a particular stock. Not sure, but its so much easier and maybe more reliable if you plot them yourself. is it ok to take ltp instead of close ? LTP and close can vary, better to stick to close. Will try and include Renko sometime soon. Any update on this topic. Sir, Is there any facility to see the vertical (y-axis) price line in the charts, in terms of % value (% value w.r.t the previous days close price) in both Kite and Pi. The same is available in i-charts. If not available kindly add the same, since it will be very useful for us instead of manually calculating the same every time when the price moves up or down. Thanks for the feedback. Unfortunately we do not have the option as of now, not sure if we can add this feature easily. I’ll anyway check with our team. Sir, What is Periodicity, Interval and Days shown in the pop up window, on trying to open a chart in Pi. This is not possible in Kite, however you can trade from chart on PI wherein this is possible. I found many instances where there was a red candle formation even though it closed higher than the previous candle. What could be the reason? Can you please share some examples? Also, where did you find this? On kite/Pi? I found it on Zerodha Pi on a Nifty daily chart. Now, I don’t know if I have misunderstood something. On November 9, there is a long green candle but on November 10, I see a red candle although it closed above the previous candle. Can you please check and reply? Request you to please email [email protected] for this. Thumb rule, if the closing price on Dec 10 opening price on Dec 9, then the candle will be green for Dec 9..
No need to mix Dec 9 & 10..
Green and red color of the candle on a particular day, depends only on the opening and closing price of that particular day.. Sorry..in the last comment, greater than and less than symbols could not be posted in the comment. If Closing price on Dec 10 is less than opening price on Dec 10, candle for Dec 10 will be red. If Closing price on Dec 9 is greater than opening price on Dec 9, candle for Dec 9 will be green. Don’t mix Dec 10 with Dec 9. In Kite whenever we click on the notification symbol (i.e. Bell Symbol) all the Menu items on the top ( e.g. Dashboard, Orderbook, Holdings, Positions, Funds and Apps) are vanishing. Please check and solve the same. Thanks, will share this feedback with kite team. As there are 2 types of Renko charts, 1 with only body and 2 with upper and lower shadows. Can some body help me if i want renko chart with upper and lower shadows on KITE. I’m not too familiar with Renko. However, I’ve requested one of my colleagues to touch base with you soon. Hi,kite is provide this services.he called coloured bar(without shadow) and candle stick(with shadow).I hope you not have any queries on this topic. Is BUY STOP and SELL STOP orders available in Kite and Pi as available in Meta Trader. You mean a regular SL? I am not meaning the regular Stop Loss orders. BUY STOP and SELL STOP are pending orders as explained below, along with BUY LIMIT and SELL LIMIT for comparision. Buy Stop = Going LONG once price comes UP to hit the entry price mentioned in the order. Buy Limit = Going LONG once price comes DOWN to hit the entry price mentioned in the order. Sell Stop = Going SHORT once price comes DOWN to hit the entry price mentioned in the order. Sell Limit = Going SHORT once price comes UP to hit the entry price mentioned in the order. Daily > 365 days/yr > one candle/day but total no.of.candles is given as 252…but it should be 365 right? Intraday 30 minutes > 2 candles/hr will make 24 candles/day..right? Your query made me realize that there is a mistake in monthly and weekly as well…there are only 252 trading days a year or about 22 trading days a week …5 a week. It needs to be adjusted accordingly. Hi, I have been doing some research on Google about Technical Analysis and One thing that caught my attention was the type scale of the price chart that we see matters a lot. Basically there are two type of scale 1) Linear scale 2) Log scale. And I have learned that using log scale is more accurate than the linear scale. I just want to throw this topic for discussion on this platform for more insights on the same. Good point, I’ll try and write a note on this sometime soon. For now, I’d suggest you stick to log scale. Please let me if we have an option in pi to use log scale instead of arithmetic. No, Ayan you cannot do that on Pi. However, you can use Kite to look at the log scale. Can u include 2 minutes time frame in the chart? At present we do not have this feature on Kite. Should be possible in the futures. Hi ,I want to know zerodha provide live renko chart or not.if yes zerodha thanks if not please provide this feature. Yes, they provide Renko chart. In kite you can find it in chart type section. Yes, please check Kite charts. I’m not sure if Kite/Pi provides this. Let me get back to you. You can customize it to any range you need. Whats the exact problem you are facing? Is there any charts that gives us information about liquidity of stocks, I f not where do I get informations about it………………. Kite has RENKO chart. But what I want to know is that are these charts closing price based or hi/low based? In closing price based charts, previous action before the close of candle is neglected and thus it becomes very misleading. Hi/low charts will have hi of candle as hi point in the period and low as low of period, this is better as entire price movement is captured this way. Please let me know Kite RENKO charts are of what type? Renko is based on price action and not on OHLC basis. I’m a beginner so sorry if I sound idiotic however I want to understand how can a chart help me trading as I can only see what has happened in last 5 minute of duration however it won’t let me know that what exactly is going to happen in next 5 minutes ? Please let me know if anyone can answer this. In fact, nothing in real world will let you figure out what will happen over the next 5 mins in markets :). We all tend to make intelligent guesses, based on prior chart patters. Thank you for replying Karthik however can you please help me with any link where I can easily understand that how to make intelligent guesses, based on prior chart patters ? 1) Can you provide the facility of automatically indicating open positions (using arrow symbol or a line) in both the Kite and the Pi Charts (I think this is available in Meta Trader and Sher Khan Platforms). We keep manually drawing Horizontal Lines to indicate the same, which is time consuming. 2) Can you provide charting in Pi as available in Kite – In Pi chart the candles do not adjust there size (height) according to the chart area available as the chart keeps moving (due to new arrival of datas). It is most of the time seen as minute candles in Pi. Will pass this feedback to tech team. Thanks. Thanks for the suggestion, Mukesh. I’ll pass this on to our tech team. Can you provide the facility of automatically indicating open positions (using an arrow symbol or a green or red dotted lines for buy and sell positions correspondingly) in both the Kite and the Pi Charts (I think this is available in Meta Trader and Sher Khan Platforms). We keep manually drawing Horizontal Lines to indicate the same, which is time consuming, especially during intraday Trades where we have to be fast enough ? Will pass the feedback to our tech team. Thanks. In pi EA (Trade script) is there any command to read the price value of the existing position that we hold ? If not can you add the same ? I do not think so, let me check with my colleague regarding this. Thanks. Heikin Ashi yes. We do not have stochastic RSI, but we have stochastic momentum on Kite. I need some clarification regarding Renko charts. 1. As per the definition, Renko charts do not consider time – they consider only value. In that case, Renko chart for a box size of, say, one rupee, should look the same for any time frame. That is not the case. You can check that from the following graphs. 2. Renko charts go back and forth for a few latest candles. i.e. they repaint. What is the logic in repainting? Is it related to timeframe? Also, if they are repainting, how can the chart be trusted? Not really familiar with Renko, Shailesh. Not sure if I can comment on this. Repainting is due to time frame which you select. So please select the lowest time frame possible to avoid repainting. Thanks for pitching in, Shakeel! But if major fluctuations happens in a minute then repainting of the candle will create confusion. So need to have pure price based chart. Zerodha team please let me know the solution for this. The candle will acquire its color only after the minute is over. And for the renko size in different time frame, I think in kite or any other Indian platform, with change of the time frame, renko brick size also changes. You check it yourself if I am true. I’m not quite sure. And it may happen because of repainting also. Sir…Zerodha’s website (www.zerodha.com) opens just like any other website on the internet. A lot of time and efforts must have spent in to make such a simplicity rich content. I really appreciate those helping hands behind Varsity. Thank you guys for bringing this introductory yet rigorous trading manual(kind of) to the “Free World”. Hey Mayur, thank you so much for the kind words! We really appreciate it. The lowest frequency for the charts is 1 minute, frankly, in my opinion, this is good enough for low-frequency intraday trading. 2. the number of trades made? Length or range for the day. I am now user. While trading intraday many shares zerodha not giving margin at the same time some shares zerodha rejecting the order. but i am having more than the order money . Please explain what is going on .. Some of the shares are not permitted for intraday trading as they are under ‘Trade 2 Trade’category. Stocks under T2T should be taken in for compulsory delivery. Hello, as I started using the chart, it was showing prices as well as volumes on the same chart, but I don’t know what happened, maybe by mistake, now it is not showing volumes which is very problematic and unconvenient. I have tried all the basic tools available at the chart’s top but nothing helped. Plz help in restoring the volume candles in the same price chart. I’m assuming you are using Kite. Click on studies and select volume chart from the drop-down. Sir , today when i was doing check my SBI ipo .. when i saw that , chart was under maintenance. after then i again checked in the start night at 9.40 Pm , now chart showing very small candle against yesterday.. yesterday it was very nice.. but now in all time frame candles showing like almost renko chart. .. So please do it correct as yesterday. SBI life is not yet listed, Ashok. Also, the charts on Kite are working fine. It denotes the Open and CLose. The next chapter digs into the anatomy of candlesticks. very useful for the beginners……..thanks a lot…..
how do i sell shares held on cash and carry basis. Select CNC while placing a sell order. Do make sure the shares are in your DEMAT account. What is the difference between “stop loss” and “stop loss market” ? Stop loss is an order which prevents you from making a certain loss beyond a certain price. For example, you’ve bought a stock for intraday at 225, you can place a stop loss at 220, which means you will book a loss and get out if the stock falls to 220. This is also called stop loss limit. The stoploss market is when you tell the system “Get out of the stock at any price if the stock falls below 220′, given this, you could even get out at 219 or 218. Whereas in stoploss limit – you will get out at 220. Thank u sir for clarifying my doubt…. This will make this charts journey complete. Will try and add that in the supplementary note. Do Zerodha have Point and Figure chart in Kite or Pi?? Is there a note about it in Zerodha Varsity? Pls do share any info about it, will be helpful. By when can we expect it in case if you don’t have. Thanks Karthik for your timely reply. If not available in Zerodha Varsity, can you pls suggest some site if you are okay would be helpful. Diljeet, sure I try and check for resources. Even a short video from Zerodha would be really helpful. Thanks, hope I’m not asking too much! Got it. I’ll and figure this out. I’d suggest the end of day chart. Actually Karthik, I am new in the stock market, can u please elaborate what is EOD the chart and in kite app/web where to see it ? EOD means ‘End of day’ chart. It contains the day’s open high low and close prices. On Kite, click on a stock name, and you will see the chart icon highlighted. Click on it to open up the chart. The time is right when the opportunity strikes! >Also note, a long bodied candle depicts strong buying or selling activity. A short bodied candle depicts less trading activity and hence less price movement. I don’t get this. IMO candle length represents the net positive/negative info made accessible to the public over the course of a day which need not correspond to volume traded. If every market participant revises their valuation of a stock upwards by x over the course of the day, this fact will reflect in close = open + x but not have any bearing on market volume. It’s also possible that Open = Close but minute fluctuations in individual valuations caused lots of trading activity. Essentially the two are not correlated IMO. A long-bodied blue/green candle means that the buyers were willing to buy at any given price during the day, hence the long candle. Likewise, in a long red candle – sellers were willing to sell the stock/index at any given price. Where can I get more information on Heikin Ashi chart style? We dont have any content around this as of now, Sunil. 1. If I want to place say 2 to 4 trades a week, my understanding is I should use 1 Day Candlestick (instead of 15 minute, 30 minutes or 1 week candlestick). Is that correct? 2. You said that after entering a trade, we must not do anything until the target or stop loss is hit. But for how long should we wait if neither of the two are hit if we are trading based on TA? 2) Technically you should wait till either one is achieved, but if you are forced to withdraw, then maybe you can consider time-based SL. Friends i m a beginer, so i want to know how add data box in kite platform in browser to see particular candle ohlc that already shown in pi platform. Dear sir, how to see NIFTY BANK-SPOT chart in zerodha kite? Or only NIFTY BANK FUTURE charts are available? There is a website of Zerodha, I have visited earlier. I am not able to find it now. The Website is about the Technical Indicators used by the Zerodha. How they work, what they are used for and complete detail about it. Can anybody provide me the link to that website. Greetings for the day. Thanks for such great explanation. If I am looking for a BTST or a Short Term trade and willing to hold my position for few days, than for Single Candle Stick Patterns and Multiple Candle Stick patterns, I would be using data for a single day or last 2 or 3 days only. 1. Please confirm if my understanding is correct ? 2. When we say uptrend or downtrend, in my case as mentioned above, how many number of days should be considered for the stock to be in uptrend or downtrend ? In technical analysis chart, in 5min chart the figure shows one scenario and in 15 min it is different. As both are used for intraday , on which we should rely. Yes, this is because they are two different timescales. Which on to depend upon depends upon your trade temperament. Consider this – you are a part of the high school Whatsapp group with about 100 people in it – on a daily basis, you will receive tons of junk messages, like the ‘Good Morning’ messages. Most of such messages are a waste – just like noise. Once in a way, you get an important message, like maybe a message for a school reunion – this would be information. In the trading world, 1 min chart has tons of buy/sells without any meaningful change in price – this is noise. But there could be 1 or 2 trades, which brings in liquidity and influences the direction of the trade. This is information. Please add Banknifty Spot chart to kite and Pi. It is available, try using ‘Bnknifty Index’ as your search in the market watch. Excellent module. is real body of Japanese candle stick represents volume traded on that day? No, the real body of a candlestick does not really portray volume details. However, similar to candlesticks, there is something called candle volume, which does. Will probably include a supplementary note on this sometime soon. So, what exactly real body revels and with which variable its length is varied ? Real body represents the price action for the day, thats what it represents. Thanks for immediate response. You really helping newbie not only with basics but quick and clear response. Thanks. Very informative and well explained data.But sir, can you please suggest me some video modules too for the better understanding of the movement.Thank you. Superb Tutorial. Thanks for having the patience to write these and educate so many of us Karthik . Not an easy task to make it so simple . And it is free for all. What is an ideal time frame to complete a trade if only Technical Analysis is being used? Is it a day or two or more like two weeks to a month? If you are using an MA-based system, then you can look at time frames like a month or two. If you are looking at patterns then it has to be short-term – like a week or so. I compare two charts on KIte (Nifty& Indiabulls hsg. Ltd.). But I don’t understand what is that % of Y-axis. Can you please, tell me how can I compare two charts on kite & what’s that %. Aditya, Y-axis is the price. You can click on ‘compare’ option below the symbol name in the chart. Additionally, you can click on display and select 4 or 2 chart options. Please note, these features are available on Kite 3. Are you using Internet Explorer? If yes, can you try using a different browser? End of Day Chart Displays Only up to 03.29 PM Only. Last minute values are not being shown up. candle is forming from 3.29:01 to 3:29:60? We sync the data with the bhav copy every day, so the closing prices will match with the exchange data. is there option to download contents in pdf? is range trading disadvantageous as compared to trend trading? i hear people saying to stay away from sideways markets but after having analysed many intraday charts of numerous stocks i find that when the stock goes into a sideways range the support and resistance level become more clearly defined. I agree that the reward will little as the stock will not move much but by trading multiple times going both long and short throughout the day it can be seen that the total gain is almost same as one trending move gain.. so why exactly do people say to not trade range markets even when the SR levels can be more clearly defined? pl correct me, if i am wrong. I decide my intraday move from zerodha candlesticks and go for 1Day chart (located at bottom of char i choose 3M and then automatically 1D comes at top of the chart, which i believe is the 1 day chart). Now having seen this 1D chart i put my trade (long or short based on vol, cs patterns and other points from ta varsity) in the morning at 10pm. Then i do nothing for the whole day , i let either sl hit or target hit. By doing this i was getting continuous profit for the last 10 days. but for the last 3 days i am getting continuous losses. Whats wrong in my method, Pl guide. Abhishek, you will have to introspect on each trade and analyze what went right and what went wrong. I’m sure you will find your answers. You are right Karthik. After having thought for three days and seen various candlesticks I am beginning to understand the nuances of trading and the meaning of your words now. Entry, exit, stoploss, rentry, adjusting stoplosses all have meaning. it,s tough game really! Clarity of thought, quick right decision and a little bit of luck may improve chances of a trade in your favour , but there is no guarantee to success is all I have understood. Click on the studies and load the volume chart, back again. How can i access your chart to my website is there any method or module? When will I find Time series on charts on zerodha.. i mean tool of time series/time gaps? What do you mean by that, Rushabh? You can start with a 15 mins chart. is it possible to get lower then one minute timeframe candlestick chart say 30 second or 15 seconds. also what is your opinion on tick charts. Are they really better then time charts. No, not possible on Kite. But I personally think, the lower the time frame, the higher is the noise component. first all I would like to say a big thank you from the bottom of my heart for this wonderful chapters. I m new to finance and I feel very comfortable after reading this. now my question to you is that what is “Mark to Market” with an example. Gaurav, thank you so much for the kind words. pls tell me what are the charges of ” Pi chart” uses. No charges for any trading platform from Zerodha. Hi Karthik! To begin with, I congratulate you on the simple language used for easy understanding of new comers like me. ‘The data can either be information or noise. As a trader, you need to filter information from noise’. Also advise how do I draw trend lines on the daily charts while the market is in the session. Noise is when you look at high-frequency data – for example within a 5 mins window, a stock could have traded between 100 and 100.75 several time. A trader trying to digest this information at every trade (tick data), according to me is dealing with noise (unless you have a HFT strategy). So lower the frequency, higher is the noise and vice versa. Thanks Karthik the information is helpful. Can you suggest a free software or site where I can see or record the daily HLOC rates of scripts to help me select scripts for trading. In fact, I have read about it somewhere in the Varsity or in questions and answers but am not getting it. Varsity is simply best. Also appreciate you and your team for explaining complex content in simply way to TA beginner like me. Regarding Candlight charts in kite, cannot it possible to highlight Spindle or Dojji on charts directly by software as indicators part of the chart. Thanks for the kind words, Prasad. That may be a little tricky. I’m not sure if that would be possible. Let me check. “filter information from noise” Please elaborate it in detail. I didn’t get this point. Frequent data like tick by tick data is noise (unless your system is designed to deal with it). In general, larger the time frame, the better is the quality of the signal (information). Thanks Karthik… Got your points.. varsity really helping to understand stock market . I’ve just started reading it and found very helpful and easy to understand. I appreciate it. As mentioned above long bodied candle depicts strong buying or selling activity. A short bodied candle depicts less trading activity and hence less price movement. What would you say about the length of the upper and lower shadow? I’m not too concerned about the shadows, simply because it could be an intraday spike with no real trading. Can u please provide BUY and SELL order directly in the charts in Kite? I know it is there in Pi but there is some bug in it and its chart features are very cumbersome to use. So, Please provide the same in Kite as soon as possible. I’ll pass this feedback to the tech team, Raj. How do I access the daily chart i.e 10 min charts of a particular period or a particular date of the past? Change the frequency to 10 mins, you can check the 10 mins data for the last 3 years. Zerodha have a very good charting platform ie kite. Your team have done a great job. But there are some issues which need to be ractified. First issue I am facing is drawing/analysis disappeared next day after log in kite & Second issue – can we expect permanent order type in your platform (ie. we shall place a stoploss or buy order untill execution). This feature I think shall be very useful for working professional as well as regular trader. Drawings are locally cached. As long you don’t shut down your browser completely, the drawings will remain. sir, on kite i am not able to scroll charts by finger after turning off crosshair function. is there any new changes brought in kite? i.e. earlier after scrolling to right i was able to see chart of previous day or earlier days. from yesterday i am not able to scroll it at all. No, there are no changes, Pratik. okay i got to know reading of the chart and types , so now how i create this charts and trade by self decision ? 1. How will a bearish candle stick represent when close price and low price are same. 2. Sir you mentioned about noise at the end sir please provide an example as to how to differentiate noise and information. 2) If the frequency of data flow is high (like a tick chart or say 1-minute chart), then the data set can contain a lot of unnecessary noise and very little information. 1. How longer the real body show strong involvement of buyer or seller and it can be measured in numbers. 2.Can we say higher real body means high votality and lower real body means less votality. 3.What does indicate longer the upper/lower shadow and shorter the upper/lower shadow. 1) YOu can check the range for this. 3) Again, you can treat this similar to the volatility. I have few queries and I have found your course very helpful at least to understand where I was wrong till now. 1) I know you have explained about the S&R levels are very important and how to figure them out from a manual graphical study point of view. I see a lot of formulas to also calculate the S&R. Do you suggest using the formula to calculate the S&R or you would suggest to manually find them? Any suggestion on how to automate? I am trying to put them in an excel sheet for lil bit of automation. Hence asking this question. 2) Can we take a call of Buy or Sell based on few combinations? Like Bullish Marubozu + VolumeUp or do we have to rely on complete pattern matching? I know this will come with experience however want to know your view. 3) Sometimes I see although the MACD and RSI Suggest the reverse of what is happening in the market. Can we rely solely on these indicators? Thank you in advance for all your hard work. 3) Nope, I’d not suggest that. I prefer to rely more on price action which is manifested in candlestick patterns. I plotted 5 Days 1 Hour chart today (11 Feb 2019) in Kite and noticed that from 23rd Jan-4th Feb there are no candles..just some small horizontal lines. The market had fallen 750-800 points in 5 days and recovered back on 4th Feb. Also, those horizontal bars were also not spaced at 1 hour…is it an error or am i missing something! Kindly let me know.. I checked a couple of stocks and they all look fine to me, Alok. Which stock are you looking at? Hi…sorry i forgot to mention..i was looking at the nifty chart…i cannot attach the snap here..else i would have done that..
Nifty too looks good to me, Alok. Can you refresh your browser and check again? Yeah…its correct now…all candles are visible at 1 hr gap…I still have the snap though and its looks like a hole in the pattern:))…so i asked just to see if they were some special sort of gaps or some weird pattern! !😂Turned out to be a tech glitch!! what’s the significance of random black candle in the colored bar chart? You should not get a random black bar if the colour code is set to say a green and red. Request you to call our customer service for this. Can technical analysis be used for mutual fund NAV analysis? I think it is best to avoid that. Hi, Thanks for your reply. Is there any other form of analysis which can be used for studying the pattern of NAV movement? You can also check the fund’s factsheet where you will find a lot of other information. I want crude oil chart closing 1 HR basis, I mean 9:30 am to 10:30 am candle, again 10:30 to 11:30 am candle. IS is possible??? Yes, shift the frequency to hourly charts. Manas, the hourly candle starts from 9:15-10:15, 10:15-11:15 etc. You cannot set a custom time frame here. can you please suggest further reading material for volume candles?? There is nothing more to volumes. This is the only basic concept. What about candle volume chart? it has 5 types of candles. what do the colours mean??? Rohan, we have not discussed it here as I don’t really find any special advantage of candle volume chart over a regular candle chart with volume overlay. when will it be available for cds? It is available for EQ and commodities for now. CDS is on the list of things, hopefully soon. Unfortunately cannot give a timeline on this. Wouldn’t line charts with different colors be a better technique to visualize this data?